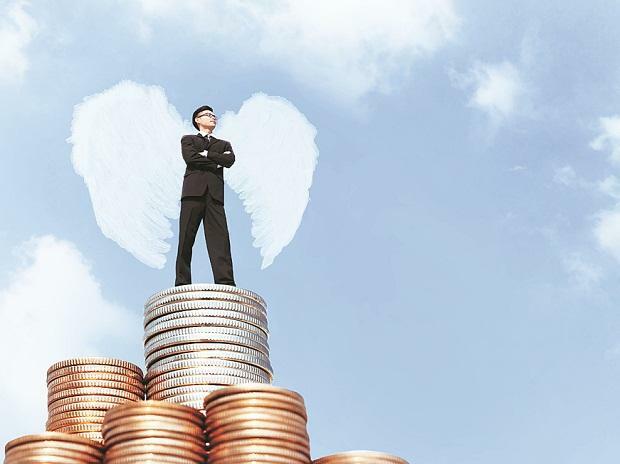 Investors with bets in banking and infrastructure funds have started seeing healthy returns with beaten-down corporate lenders likely to see improved profitability and private sector capital expenditure (capex) expected to pick up in the next few quarters. 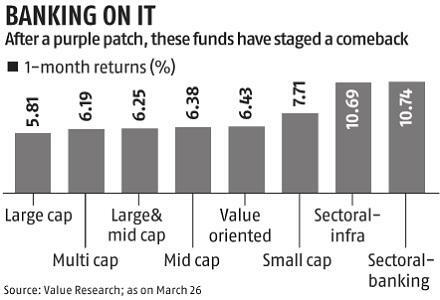 According to the data from Value Research, banking and infrastructure funds have posted more than 10 per cent trailing returns in the last one-month period (as of March 26), making them the top-performing equity categories for the period. Fund managers say different factors are driving up the prices of infrastructure and banking stocks, but expectation of a benign interest rate scenario has been a common trigger. “The domestic interest rate conditions are expected to remain conducive even as the US Federal Reserve is indicating it will go slow on interest rates hikes. This should keep domestic interest rates at current levels or lower, which is positive for both infrastructure and banks,” said Sonam Udasi, fund manager at Tata Mutual Fund (MF). The strong returns posted by the two categories have come after a difficult period as fallout of the Infrastructure Leasing & Financial Services (IL&FS) led to 11-13 per cent fall in September. Both the categories had given negative returns in four of the previous six months. The sentiments around banking stocks have improved, with corporate lenders expected to see profits revive as asset quality issues settle down. Banks also have the opportunity to take back market share from the non-banking financial companies (NBFCs) which face liquidity challenges, fund managers added. “There is further scope of rerating for some of the banks. The corporate lenders are expected to see normalised profitability as their asset quality improves. Credit growth has improved in the last few months and banks could take back market share from NBFCs as they participate in this growth,” said Vinay Sharma, fund manager, Reliance MF. The BSE Bankex has gained 13 per cent in last one-month period, against 7 per cent returns posted by the market benchmark Sensex. The major banking gainers include IndusInd Bank (22 per cent), Bank of Baroda (20 per cent), YES Bank (18 per cent), State Bank of India (16 per cent), and ICICI Bank (14 per cent). The possibility of private capex cycle kicking in has made fund managers and brokerage houses bullish on infrastructure space. “Government impetus on infrastructure spending has helped the sector in the past quarters. However, with capacity utilisation inching up to 75-per cent levels in most of the sectors, we could see private sector capex also picking up in the coming quarters,” Sharma added. The BSE Infrastructure Index has gained 14 per cent in the last one-month period. The major gainers include Dilip Buildcon (56 per cent), Sadbhav Engineering (43 per cent), NCC (34 per cent), and Gujarat Pipavav Port (32 per cent). The broking house CLSA recently firmed up its bullish stance on the revival of capex cycle. “Our thesis of a turn in India’s capex cycle was validated by third quarter backlog growth of 12 per cent (year-on-year), which is the second highest in 22 quarters. This was despite execution growth accelerating to 21 per cent, which was the second highest since 2012,” the analysts at CLSA said in a report. Among its top picks, the brokerage has recommended Sadbhav Engineering and NCC to its investors to ride the infrastructure growth story. The upcoming Lok Sabha elections and expectation of a stable government are also drawing investor interest in infra space. “Infra stocks are seeing a buying spurt as government spending is expected to increase after elections,” Udasi added.